In my discussions with various Online retailers about optimising their online channels, one of the main challenges to adopting web analytics into their online strategy has been the issue of justifying the cost of using a tool like Omniture / Web Trends / Coremetrics and whether there will be a return on such investments. I understand their thinking considering the cost of implementation and getting good analysts (which by the way is not an easy task) but what I usually advise is that you can get started by using a free analytics tool such as Google Analytics. This gets you started on the path to knowing what is happening on your site and how to improve the performance of the online channel. Even though free, these tools will give you the ability to make better decisions on your page layout, SEO & PPC strategy. I have implemented a few tools like Omniture, Web Trends, HBS, and Google Analytics for a few clients and they all have one thing in common, within a few weeks of extracting basic reports, they are able to make the right judgement on where their focus should be. So if you are a small business, if you operate an online retail shop, then it is in your best interest to begin to look at some of these tools. I have been researching a list of free analytics tools when I stumbled on Six Revisions. So here you go! 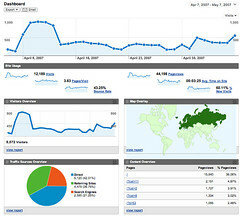 a list of 10 promising Free Web Analytics tools.